Yes, I know January is over, but we finally have our first patient of the month for 2014. Sarah has been a long standing patient through our her football career. Recently leading up to this past Super Bowl weekend, her and her team, the New York Sharks, were featured on ” Good Day New York“. Here’s a little more about her and her football career. The youngest of three children Sarah Schkeeper was raised in Livingston, New Jersey with her two older brothers by her mother. Though she played football with the boys growing up Sarah didn’t play an organized sport until joining the New York Sharks, the longest running and winningest professional women’s football team in history, in 2009 while attending graduate school for her M. Arch I. She has started as either right or left guard in every career game. 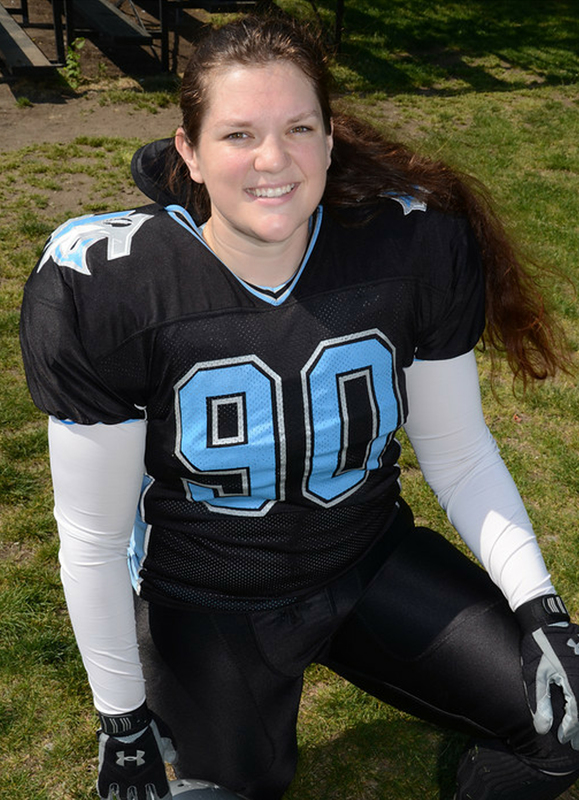 In 2013, through a nationwide tryout held in Austin, TX, she was selected to represent the USA as part of USA Football’s National Women’s Team in the second IFAF Woman’s World Championship to be held in Vantaa, Finland. They beat Sweden 84-0 and Germany 107-7 to advance to the gold medal match in which they beat Canada 64-0. She was the starting Right Guard.